Yummy, Low Calorie Diet Food -- Plus Where to Buy! : Low Calorie Indian Samosas? I'm a huge fan of Indian food and I'm always looking around for low calorie ways to integrate it into my diet and lifestyle. I blogged previously about my favorite low calorie naan that I buy at Trader Joes (everyone should try it -- it is sooo good and so many less calories than most Naan) and the low calorie Kofta Curry dish that I buy at Whole Foods. Today, I'd like to introduce you to another one of my Indian finds -- Crave Samosas, Veggie Delight (note: they come in chicken and beef versions as well, but I've never had them). As boxed, 3 of these samosas are only 100 calories, with 2 grams of fiber, and 2 grams of fat, making them only 2 weight watchers (WW) points. The trick to keeping these samosas low calorie is to *not* follow the directions on the box which suggest that you deep fry them. Instead, heat up a pan with a teaspoon of oil (if you do this, make sure you count the points), or a tablespoon or two of water, or just a non-stick cooking spray like Pam, and pan fry them rather than deep frying them. Alternatively, you could put them in the oven and bake them. They will be just as delicious and yummy as if you had fried them and you can enjoy them that much more knowing that they are not greasy or bad for you. Note: This yummy tip works for a lot of foods (like french fries), so always keep it in the back of your head when you are craving fried food. 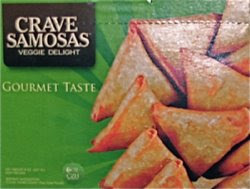 You can buy Crave Samosas (all three types, although make sure to double check the calorie information for the non-veggy version -- I didn't get a chance to look) at Whole Foods in the freezer section. Enjoy this super yummy Low Calorie Indian Food find! Another great post, Juliet. I cannot agree with you more that health-conscious eaters should follow "directions on the box" with discretion. This principle can be applied to many things that are typically considered "off-limits."